As with last year, I think that a thread about Tolkien events this year (including Oxonmoot 2015) would be a good thing. Kath and I have been growing our beards all year and are coming to Oxonmoot, as usual. Looking forward to seeing you there! Nice to hear that both of you, Aganzir and Kath, will be at the 'moot. I'm hoping to be there myself. It's nice to hear that it will be 4 days long, as it gives people a better opportunity to get acquainted or reacquainted, and it doesn't squeeze events into too small an amount of time. As Oxonmoot will be with us next month, I'm just wondering if anyone else here will be coming, and if so, if you have any plans. Will be there from Friday. Not sure what time. Anyone coming early on Thursday? We'll see you then, Pervinca. Is there anyone coming early on Thursday? I'm sorry to say that I will not be able to come to Oxonmoot this year. I look forward to reports and lots of photos from those of you who will be there! I will not be coming to Oxonmoot this year. I shall have to find some other way to get a fix of my Downers. Please those who attend post many pictures. I think organising a moot to Iceland some time might be really, really cool. No clue why Iceland, but if that happens while I'm not studying, I'm so in! Tolkien graduated in 1915 with Old Icelandic one of his special subjects. The Icelandic sagas are part of his inspiration. In fact, the names of all his dwarves and of Gandalf comes from Snorri Sturluson's Prose Edda. Plus Iceland has quite a few volcanos, some extinct, some not.The possibilities for RPGing are endless. I (and I've no doubt others) are sad that you won't be able to make it to this year's Oxonmoot, Esty and Bêthberry; but we'll let you know how we get on there! I will be in Oxford during Oxonmoot as I will start a DPhil in Materials Science there next month. I can't say for sure if I will be able to attend, but I'm thinking of getting a day ticket for Saturday. I (and other people on and outside of the Downs) will be looking forward to seeing you there, Might! Sadly we didn't take a Downer group photo this Oxonmoot! I don't really know how it escaped our mind, but here I am, back in Finland, with nothing to prove I met Barrow-Downers other than Kath. However, I did spy at least Hookbill, Faramir Jones, The Might (who's lovely! ), Poison Ivy, Pervinca Took and narfforc among the participants. Hope I'm not forgetting anybody! 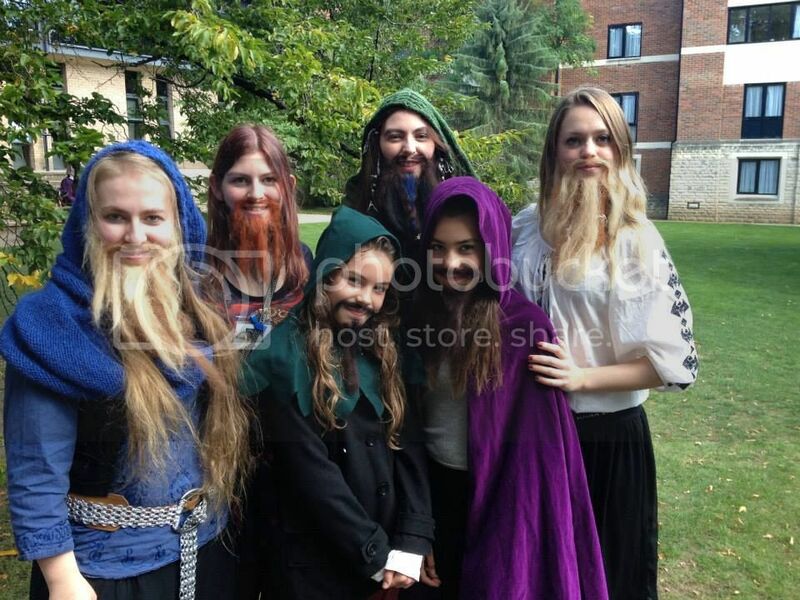 Anyway, Oxonmoot was lovely, and we had a full total of 6 dwarves this year! Last edited by Aganzir; 09-17-2015 at 04:14 AM. It was a great time at Oxonmoot and I hope more Downers will come next year! I always love seeing the Downers at Oxonmoot, even if I can't party at the rate I did when I first started attending the event. It was great to see you all again, even if some years I am quieter than others. Old age, you see. Although I still enjoy and wholeheartedly approve of singing 'Diggy Diggy Hole' at room parties. I also wholeheartedly approve of increase in the dwarf population. As Aganzir, The Might (whom I had the pleasure of meeting for the first time! ), and Pervincia Took have talked about their impressions of the 'moot, I'll add my (very belated) ones. One of the many interesting items on display was Tolkien's dust-jacket design for The Hobbit, which was done by him in full size. Other items of interest included the manuscript of Kenneth Graham's The Wind in the Willows, and the first of the series of letters to his son, which was the genesis of that work. Also, there were first edition copies of the first 6 of Jane Austen's published works, open at the first page of Pride and Prejudice, with an explanation that the Bod didn't acquire them at the time of publication, then regarding novels as trashy things only women read, and unworthy of being in a great library! St. Antony's College, where the 'moot was held, while exceedingly young by Oxford standards (1950), impressed me. The staff I had dealings with were very helpful, and I was impressed by the quality of my room. Also, everything, except for the art show, was quite close together. Perhaps it was the fact that the college is for postgraduate study, and has particular interests in international relations, politics and economics. I later heard that of the people registered for the 'moot, 45 were first timers, to whom I tried to be friendly, as well as renewing acquaintances with my fellow 'old timers'. It was nice to later hear from 2 of the first timers that they'd decided to come to the next 'moot! As Aganzir said, as well as herself and myself, there were Kath, Hookbill, The Might, Poison Ivy, Pervincia Took and narfforc among the participants, as well as the later joined Scilens, to whom I again say welcome! My own talk was at 3.10 that afternoon. There were 55 people present in the theatre, and it was well received, judged by the questions and comments afterwards. A good one on the Mouth of Sauron by Chris Melville followed. I also enjoyed the next lecture, by Maria Alberto on 'Seduction in Tolkien's work'. There was supposed to be a debate, 'Jackson made Lord of the Rings for the fans and The Hobbit for the studio'; but it had been cancelled, as only one person volunteered, who had offered to speak on the against side (me!). This was in my opinion, and it appears in those of others, the best talk at the 'moot. Lunch that day was interesting, as a few things happened. Society Chairman Shaun Gunner spoke; length of membership badges were given out to those (including me) who wanted them given at the 'moot; two portraits were auctioned; a presentation was made to Shaun; flowers were given to Oxonmoot Chair Elena Krysova; and Harm Schelhass offered an Unquendorian invitation to fans present to come to that society's 'moot. I was on stewarding duties in the Ops Room for most of the afternoon. Regarding the Ents and Masquerade, Denis Bridoux and I did a sketch at around 5.25 p.m. Other items of interest there included the Entwives Sketch (with Ivy and Maggie Bailey); the Barmaid sketch by Angie Reynolds; the Dwarf Tossing, involving certain dwarves whose photo we've seen here; and the ending with Catherine Thorne singing 4 songs very nicely. Then followed dinner in the Rose and Crown on North Parade, before I and others were back for the party. I later managed to have at least some hours' sleep before breakfast on the Sunday morning. There had been a pleasant announcement that as the cleaners were not coming in that day, we didn't have to (as usual) vacate our rooms by 10 a.m.
Later on the Sunday, we went to Enyalie as usual. Like Tolkien had Father Christmas say about Christmas, it's always the same and always different. Things were particularly moving when Shaun read out the bit from The Silmarillion about Luthien moving Mandos to pity, and the choice then given to her. This was in the context of absent friends, including Jef Murray. On our return, after I said my farewells to people, leisurely packed and checked out, I went into town, to have lunch in the Lamb and Flag with some others. When lunch was finished, as I had a few hours before going on to Heathrow, I took advantage of Oxford Open Doors, and managed to get into 2 colleges: Oriel, then All Souls, which was very nice, before I left for Heathrow around 5 p.m., to get back to 'normal' life. In terms of another new member, who was at Oxonmoot 2015, and who has later joined, I want to mention KarlPeredhel.